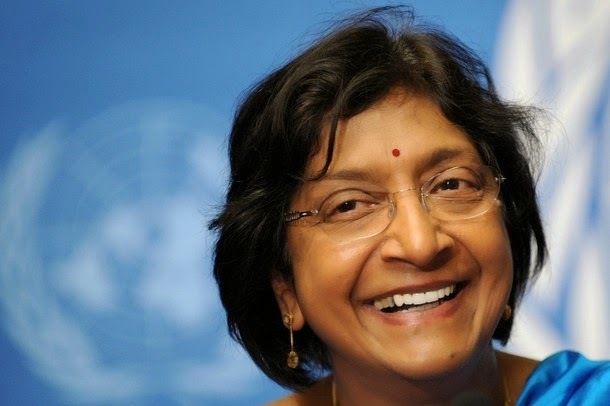 ( May 24, 2014, Geneva, Sri Lanka Guardian) The U.N. Human Rights Council’s Commissioner Navaneethem Pillay is very much keen on starting the Investigation Committee with regard to the Sri Lanka. The UN Human Rights Council passed a resolution to appoint a committee to conduct the investigation according to the UN Human Rights Commissioner’s orders; they are actively involved in the process. By next month first week of June, the information about the investigation committee will be announced by Navaneethem Pillay. For the U.N. Human Rights Council's Investigation Committee, the Sri Lankan Government should extend its fullest co-operation and support. Similarly, the moment the announcement of Investigation Committee by Navipillai starts, co-operation and support from America, Canada, Britain and other European countries are expected. The required fund for the Investigation on Sri Lanka has already been received by the commissioner Navaneethem Pillay. Now they are in the process of choosing the members of the Investigation Committee. But however, the Minister Peiris in his speech at the U.N. Human Rights Council has rejected the International Investigation and not willing to accept the Investigation Committee, so also the minister and speaker Kehaliya Rambukwela.